The rains came late this year but they were plentiful. The grounds have just started to dry and farmers are gearing up to learn about dry season farming. Africa Windmill Project is preparing to launch 12 new agriculture clubs which will educate 360 farmers. We have a 4 year program, but food security is often established after the first growing season. One of the keys to Africa Windmill Projects success is partnership with the farmers. For the first year the farmer provides all of the labor and tools, AWP provides a "starter kit" of fertilizer, maize seed, pesticide and irrigation pumps, the second year the farmer provides 50% of the fertilizer, pesticide and AWP provides maize seed. After these first two years of input provisions the farmer is able to sustain their own gardens by reinvesting from the previous crop. AWP continues to train the farmers by meeting with them regularly in years three and four. In August we surprised some of the original agriculture club members from Mziza that we worked with in 2011 to see if they had continued their gardens and if indeed food security had been achieved. We were delighted and humbled to see the impact that education and empowerment has had in this community. You can read a story about what we found by clicking here. So if you are still reading THANK YOU! We haven't put in fancy pictures or catchy formatting. We really just want you to understand the impact that YOUR partnership makes to Africa Windmill Project. We are busting at the seams with farmers who are asking for our help, currently there are over 3,000 farmers that are actively in our 4 year program. We wanted to share two stories about the impact that these trainings have, and to ask you for your help. It costs AWP just under $200 per farmer the first year. Would you consider partnering with us toward these trainings and first year inputs? Keep Reading to see what YOUR Partnership Means to Farmers. Our amazing staff sends us these stories, they do an outstanding job of understanding and communicating in English. As you read, imagine you are sitting down with one of our staff and they are sharing with you a story about their day. 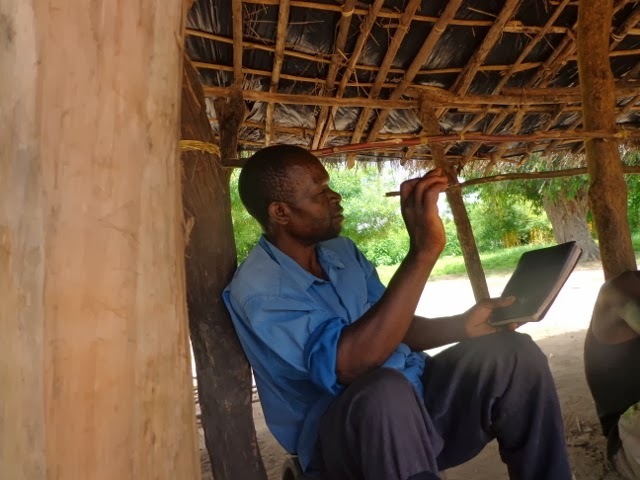 Chasowa Sandisi is a farmer in Chigonthi Extension Planning Area and a member of Chimwemwe club of Nkhota village. He joined Chimwemwe club which was initiated by Africa Windmill Project last year in 2017. Before joining the club to work with Africa Windmill Project, Mr. Sandisi was growing maize on his plot which is 0.5 acre but he could only get less than MK 10,000.00 ($13.88 USD) from the sales of the crops. This was because he planted maize seed that he got from his friends and some which he kept as seed from the previous rain seasons. The problem with that seed was that it had lost its vigor. He could also not afford fertilizer which made yield from his garden to be very low. This year, Mr. Sandisi was among the famers that received inputs (1kg of maize seed and 5kg of NPK basal dressing fertilizer) from Africa windmill Project. Before receiving the inputs, Mr. Sandisi together with other members of Chimwemwe club attended a number of trainings offered by Africa Windmill Project. The trainings included: Agriculture business training, leadership training, vegetable management training and Irrigation Water management training. From the inputs that Mr. Sandisi received, he is expecting to get a net profit of MK 140,000.00 ($194.44 USD) when he sells the fresh maize that he has produced in his garden. This means that he is going to make 14 times the amount of money he was getting when he was farming before being trained by Africa Windmill Project. 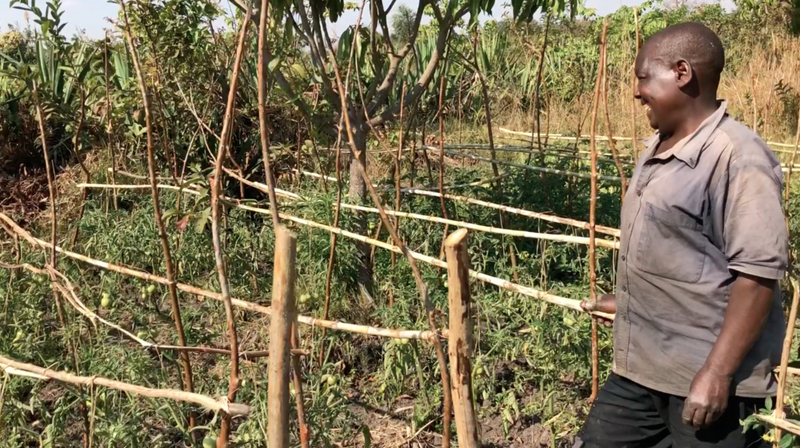 The money realized will serve as capital and Mr. Sandisi will be able to afford his own seed and fertilizer to re-invest into irrigation farming in the next growing season. Yohane is one example of the majority of farmers who joined Africa Windmill Project irrigation farming at the point when he did not have confidence and trust in the crop the project was emphasizing on due to the past experiences. Maize is commonly grown under irrigation however, the results of the traditional way of irrigation farming (watering cans or buckets) over the years have been very discouraging to most farmers when they compared the time and resources invested into the work against the results they got after the season. Such being a common experience among farmers it has been generally not easy for farmers that have just joined Africa Windmill Project in a new area to comfortably invest their resources into something they do not trust even when they have enough to do so. When our farmers begin trainings with us we understand what they have faced and we know we need to build their confidence in the "similar" crop this requires wisdom and tact or the technology will not be adopted. Irrigation farming is Africa Windmill Project main area of focus. Teaching farmers how to grow food and empowering farmers economically once and for all. To achieve this Scientific information is communicated in local terms that can be easily understood by farmers for a better crop production. Lessons learned in a class setup are put in to practice in individual gardens to demonstrate the usefulness and the reliability of the information taught. In his first year Yohane was ready to attend education trainings taught in a class setup but still could not trust the results. As a result, Africa Windmill Project gave Yohane one kilogram starter park seed and five kilograms’ basal fertilizer. He also contributed five kilograms’ top dressing fertilizer and pesticides. Following best agriculture practices his crop looked nice from the beginning so he began to have confidence in the Maize and in his trainings. Yohane did not only see a promising crop but also learned that knowledge is power. 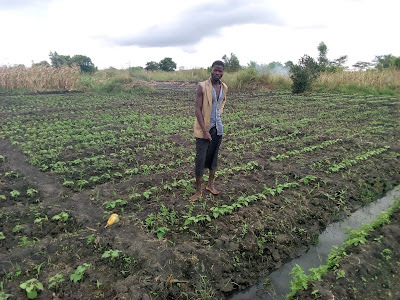 He realized that the long past experience of poor irrigation yields was as a result of the knowledge gap that has long existed between farmers and responsible agriculture officers. Africa Windmill Project has merged the gap and now Yohane has no choice but to save money to buy more inputs that he will use in the next season. When he was asked why he thinks saving for more inputs next season was important, his response was “Without Vision People Perish”. From the inputs that were donated to him, his eyes are now opened. He has never before had a good and promising crop as this year. As a result, he feels he does not need to wait for someone to tell him what to do, he is more than ready to invest all his money in maize irrigation farming. His final words were thanks to Africa Windmill Project for giving him a life time opportunity that he has been neglecting in the past and did not know he was missing a lot, may God bless Africa Windmill Project. Thanks so much for Partnering with us! Have you ever wondered about a group you used to be a part of or how your co-workers were doing from a couple jobs ago? Africa Windmill Project's beginnings in 2007 seem like a long time ago. We started our first agriculture clubs in 2010 and walked alongside those farmers for 4 years. 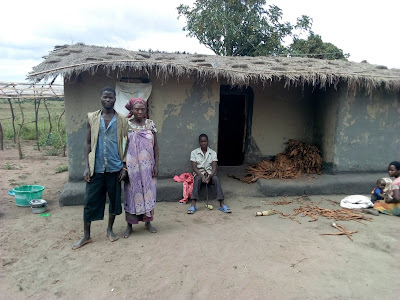 Earlier this month we were wondering how this first group of farmers were doing and just what they thought of Africa Windmill Project's program now that they had been on their own for almost 4 years.... The agriculture club was in Mziza and that first year of trainings there were a couple of farmers that immediately stood out as lead farmers in that community. Working alongside and watching these farmer's abilities and harvests grow was the fuel that ignited what today is impacting thousands of families. 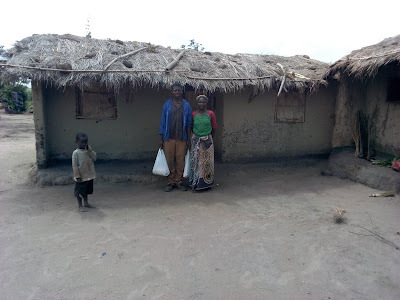 One of these lead farmers, Japhet, doesn't live in Mziza anymore, but we tracked him down and he guided us to his new farm. A six acre farm near his wife's home village. he purchased the farm last year and had already made quite a remarkable homestead. 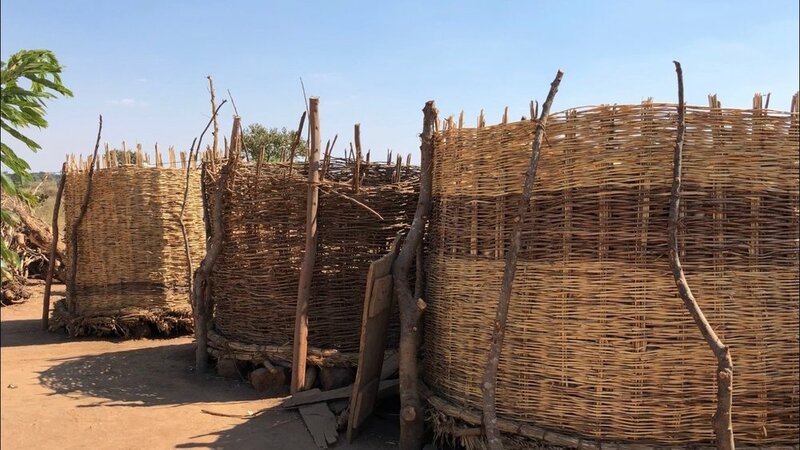 When we first arrived in Mziza we saw one grass corn crib, now on Japhets new land he had three bins that were over half full. He had built (with fired bricks) a home for him, one for his older girls, one for his older boys, and one for his oldest married son. He had a garden full of tomatoes and was so excited to show us his gardens and explain to us his vision for his farm. He even has a good location picked out for when he is able to get a windmill! He told us that his neighbors had asked him where he got his money. He said to them "from you, you buy my food" and asked them if they wanted to learn how to farm like he did. As you can imagine Japhet is now training his neighbors. When we showed up he asked if there was any way we could get him some more of the rope and washer pumps so he could give them to his neighbors. He still has the one from his trainings and uses it when he is doing his dry season gardening. We were so encouraged by our visit with Japhet! There were some other farmers that we visited. Mr. Storo, Mr. Mchenga and even some that had never been in the club, but had learned by watching and were now farming using irrigation and the sustainable agriculture practices. We were so encouraged to see that MZIZA IS FOOD SECURE and has been since the first dry season gardens in 2010! It is wonderful to see these farmers independently food secure. They are self sustaining and enriching the lives of their communities as well as empowering others to become self sustaining as well. It was a GREAT VISIT! UPDATE: At the beginning of August 2018 we decided to show up and see what Mr. Japhet was working on. Much to our delight he welcomed us and was eager to show us his garden. We didn't find Japhet in Mziza, but picked him up at a trading center where he guided us to his new 6 acre farm. It turns out that Japhet moved to his wife's village where there was more land available and purchased a new much larger plot of land. a full Update on Japhet with pictures of his new farm. 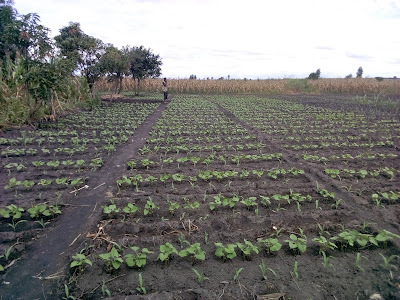 Blog Archives: January 2014: "Taking The Lead" He's no stranger on this blog, Mr. Japhet is our most outstanding farmer. Now he is an outstanding leader. Japhet has been the Mziza Farming Club chairman for 3 years. This year, the original club has doubled in number, up to 24 members. As the number of members is growing, the club has split now into three smaller clubs. Japhet is the new club president, responsible for establishing new clubs, training and coaching new members in the area. Last week he took us the Mkwende village where farmers are preparing to start irrigation farming. 17 farmers responded to the initial call for interest. Now they will begin the process of learning how to make compost and prepare their gardens for the irrigation season. As the rainy season is winding down, preparation for irrigation is ramping up. But as we have noted in years past, many farmers don't wait for the end of one season to start in on the next. They farm year-round. This is exactly the result we are looking for! This month we are recognizing two outstanding families for their leadership in planting early and often. Zude and his family are busily harvesting their tobacco (which is the first rainy season crop to be harvested so that it can dry in the shade). But Zude knows that the tobacco market will not meet his family's needs for much longer. He has decided to plant a large irrigated garden - big enough to feed everyone in the house and fund some home repair, medical, and health needs. He has shown good leadership, not just by planting early, but by also planting beans between his rows of maize. This will ensure a better balance of protein in the diet, and it increases watering efficiency for the beans when the maize is tall enough to provide shade. Another great leader this year is the Toyoyo family. They are new to irrigation, but have impressed their fellow farmers with their hard work and discipline. The family is often the first to the gardens in the morning and last to leave. They know that time spent working on their crops is not wasted. By spending more time in the garden, they are able to do more than just weeding and watering. They reduce pests by clearing brush from the hedges, and they carefully control diseases by removing any signs of infection from the field before it spreads. This saves them money on pest and disease control chemicals - making for a healthier crop overall. 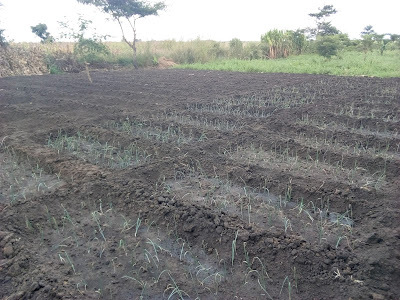 They have also planted onions next to their maize garden. Onions are an important ingredient in most local stews and vegetable dishes. Demand is always high, but supply dips during the early winter, exactly when the Toyoyo's crop will be ready for sale. Good planning!